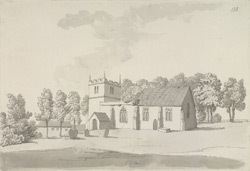 White's Directory of 1853 comments: "The church, dedicated to St Margaret, stands on an eminence, and the tower, which has three bells, appears to have been built in 1663." The church has parts built in the Norman style of as well as windows in the Gothic Decorated and Perpendicular styles. The top of the west tower has Tudor windows and is crowned by obelisks instead of pinnacles.